P.A.P.A. 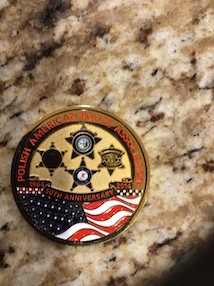 is now selling its new 50th Anniversary Challenge Coin worldwide! The price of the Coin is only $10.00 each, and that includes free domestic shipping. International shipping rates will require a shipping quote. Each PAPA Coin comes with its own holder and will make a great addition to your collection. To make it easier, PAPA has a paypal account. PayPal payments can be made to president@polampolice.org. Please include all your information, including name and shipping address. 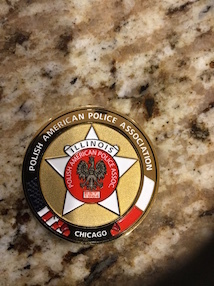 Checks can also be mailed to: PAPA C/O Challenge Coin P.O. Box 31095 Chicago, IL. 60631. Any questions, please email president@polampolice.org. PAPA is now Paypal friendly. Any membership payments, merchandise orders can be paid with Paypal! ‹ PAPA SOUTHSIDE CHAPTER IS UP AND RUNNING!!!! WE ARE EXPANDING!!!!!! › WHY JOIN P.A.P.A.